"a can-do attitude, combined with forthcoming ideas about better ways to manage CCA's telecommunications"
"a customer service ethic to aspire to"
VoicePlus Managing Director, Michael Giffney, said these two attributes have been deliberately cultivated within VoicePlus, with active encouragement from Telstra. "Some years ago we decided at VoicePlus that we needed a point of difference - something that made us stand out from all the other Telstra partners, and that promoted loyalty from our customers towards both VoicePlus and Telstra. "We decided on exactly those two points of differentiation. We wanted to be a respected partner providing innovative and unique solutions in a proactive manner for our customers; and we wanted to impress customers with our level of service. "To that end we embarked on a vision to develop a unique proprietary solution that would complement Telstra services. We envisioned a customised, automated, online management environment that would give our customers measureable cost control initiatives, reliable asset management processes, and position them to take advantage of new technologies seamlessly. "With the support of our Telstra partnership, and in collaboration with Coca-Cola Amatil, the Atrium+ solution was debated, defined, developed, tested, and implemented over a six year period. "Atrium+ has been an outstanding success at CCA providing significant cost reductions and productivity efficiencies and resulting in the Supplier of the Year title going to VoicePlus in 2014. "We are now introducing the Atrium+ solution to a number of other Telstra enterprise customers. VoicePlus has had, for a number of years, an ongoing relationship with respected global industry consultants, Gartner. Last week, VoicePlus founder and MD, Michael Giffney, attended the Gartner Symposium ITxpo in Queensland to hear keynote speakers from around the world provide insights into industry trends and new directions. "As a company, VoicePlus makes a significant investment to ensure that we remain abreast of the very latest development trends in this space. It is key to the consultative expertise that we provide to our customers. We are constantly thinking and developing for tomorrow, next year and in five years' time. "Standing still in the IT and telecommunications space means actually going backwards. We are determined to provide vision, innovation and leadership in all our dealings and to keep moving forward striving for constant improvement." The second and equally important cultural focus of VoicePlus and Telstra was on providing superior customer service. "Everyone says they have great customer service but we were determined to actually deliver a level of service that impressed our customes. We deliberately set about promoting a culture of personal responsibility from everyone in the business and rewarding our staff for excellence in their day-to-day interactions with customers, both internal and external. "At VoicePlus we know our single biggest asset is our people so we make very certain that we hold on to them, treat them with respect and generosity, and give them opportunities to shine." 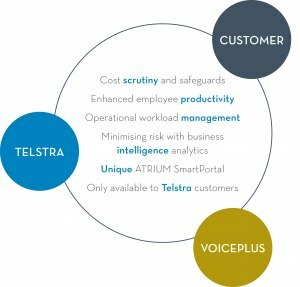 VoicePlus works exclusively with Telstra and is proud to be recognised as a Telstra Enterprise and Business Partner. Telstra is the market leader and shares VoicePlus values of innovation and service.